Has anyone posted this on your Facebook wall yet? “If you propose the existence of something, you must follow the scientific method in your defense of its existence.” Your response? What’s your friend’s philosophy, and is it sound? What questions would you ask your friend to bring out the problems with his beliefs about reality and his ideas about how to determine truth? Tell us how you would respond, and we’ll see how you did when Brett gives his answer on Thursday. Sounds like some form of scientism or empericism where one should only believe that which can be proven using the scientific method. Besides the obvious self-contradiction of this claim since it cant be proven emperically, I can think of several things this atheist believes in but can’t prove scientifically. First, metaphysical truths like the reality of the external world; that the past isn’t an illusion, but really happened; that other minds exist besides my own. Second, ethical truths like its wrong to murder for fun. Third, the laws of logic and mathmatics. Science presupposes these so trying to prove them scientifically would be to argue in a circle. Fourthly, this athiest certainly believes in science. Yet how can he possibly prove science using science and not argue in a circle? I would also add that the burden of proof that matters so much to this individual should be applied to anyone making a claim. I’m glad to shoulder the burden for any claim I make as a theist. But I wish this person would be honest enough to admit that he too is making a claim and has a responsibility to offer reasons. Prove Abraham Lincoln existed by the scientific method. Or any historical fact at all. Prove history itself exists by the scientific method. I would agree with them that the burden of proof lies with religion. Then I would challenge them on their epistemology. Is the scientific method the only way to come to know things? J.P. Moreland has a good critique of methodism in his book, _Love Your God With All Your Mind_. Any kind of methodism (where you begin with a method and arrive at items of knowledge) is self-refuting because the method itself will require justification, and that justification will require a method, ad infinitum. 1. Do you think the scientific method is the only way we can come to know things? 2. What is the scientific method? 3. How can we know that the scientific method gives us knowledge? 4. How do you know what you’re thinking right now? 5. You the laws of logic be demonstrated by the scientific method? 6. When was the scientific method invented? Did nobody know anything before that time? 7. Could you tell me right now what you had for breakfast this morning without subjecting it to the scientific method? After poking holes in their scientism, I’d make the point that since scientism is self-refuting, we ought to be open to more ways of knowing things than just the scientific method alone. And I’d explain some of them–intuition, deductive reasoning, etc. First I’d ask him to clarify what he means by the scientific method. Is he saying the traditional one put forward by Francis Bacon or something else. My guess is that he’s saying if something can’t be shown to exist with material/empirical evidence then we must assume that it does not exist. Finally, I’d point out the ridiculousness of his demand in the first place. If he accurately understands whom we believe God to be, then he would understand we believe God is an immaterial being. Since science is useful only for measuring the material world I’m pretty sure its the wrong tool for assessing whether or not God exists. It would be like me giving him a rock and a ruler and then demanding that he use the ruler to find out how much the rock weighs. My first thought would be, “why did they post this?” From my encounters with atheists on YouTube many of them have had negative experiences with religious people and do not have a Christian that they can call friend in real life who is well-reasoned. I would say this post is more of an emotional response vs an intellectual one which to me requires perhaps a different sort of approach. Looking past what I would say are errors in reasoning how can I engage with this post from a Facebook friend? *The reason I am a Christian is not because I believe I can empirically prove God exists rather X. –This post changes the use of language and invites possible discussion and doesn’t argue with their largely emotional response towards religion. *I find great value in the scientific method and the benefit of science, however, I believe that there are other ways of determining the truth value of beliefs that I have. These sort of simple comments aren’t aggressive in tone and present my position in a positive engaging way. I agree with all of the posts. I especially like Jack’s perception of perhaps an emotional concern behind posting this. Even the aggressive and/or angry atheist often has some sort of negative experience that drives that anger. But lets assume that this person is someone I actually know and isn’t a Facebook “friend” whom I hardly know at all. Lets also assume that I know that this person is overall a reasonably stable, thoughtful person but has not seen the need for God in his/her life. Bernie, I love that experiment. You are my hero for the day. Thanks Amy. I felt great all day yesterday and didn’t know why. Logical Positivism and the verification principle died decades ago. See Ronald Nash’s excellent book, Worldviews in Conflict. I am not a Theist because it is cool or fun. I am not a Theist because it makes me feel better. I am not a Theist because I think science can prove the existence of God. I am a Theist because I have decided to allow the evidence to speak for itself, without predetermining what will or won’t qualify as evidence. After looking at all the various areas of evidence, I am convinced Theism does the best job of fitting the facts and has the best explanatory power for addressing all aspects of the human experience. Since we can know very little for absolutely certain, I am not bothered by some of the “loose ends”. Many of those “loose ends” exist no matter what we choose to believe. Further I believe the Christian worldview is the most complete worldview in terms of answering all areas of human existence. In short I am a Christian because I believe the Christian worldview has done the best job of answering the burden of proof regarding how the world actually is. Or something to that effect, lol! As a humanity, we have all been conditioned or indoctrinated, for all of history by ‘theological’ exegesis, particularly by those with their own ‘religious’ claims and agendas, to accept that a literal proof of God is not possible for faith. And thus all discussion and apologists ‘theodicy’ is contained within this self limiting intellectual paradigm and bubble of presumption, especially evident in the frictions between science and religion. It would now appear that all sides squabbling over the God question, religious, atheist and history itself have it wrong! That bubble could now burst at any time! Goliah – – your a nut! You need to step outside and get some fresh air, the fumes are getting to you. I’ve already tested and confirmed the new teaching described above. So if I’m a nut, I’m more than happy to be one and the air is fresh and clear where I sit, well above the intellectual pollution of history. It’s only a matter of time before sufficient numbers of individuals confirm this teaching, and establish a new moral insight as absolute, irrefutable fact, reality and perfect truth, exposing two thousand years of scholastic, theological exegesis as institutional self deception! We may very well come to remember the ‘church’ as two thousand years of the irrational and absurd, myth makers revealing nothing more then their own vain imagination and hubris. Why should we put any faith in your claim that this “new teaching” is worth listening to? Would you describe it for us? It seems a little, um, presumptuous to claim that all the greatest thinkers of the last 2,000 years have somehow gotten it wrong (not that they’ve all gotten it all right). Not too mention the apparent claim that all religion and theology is corrupted. What is this teaching you seem so enamoured with? “presumptuous to claim that all the greatest thinkers of the last 2,000 years have somehow gotten it wrong” I can only suggest that they never had it right in the first place? Theology is a human intellectual endeavor. Revelation is insight that by definition should take reason beyond the limits of it’s own understanding. But what makes this new truth claim unique to history is that believing in itself, like all faiths, is of no consequence or value at all. The claim [not mine, I’m only writing about it] is the first ever viable religious conception, capable of leading reason, by faith, to observable change which can be tested and judged on it s own merit. A teaching revealed by God and confirmed by God to anyone who will TEST it for themselves. Of course to test it, one must first believe that God is real and a source of knowledge existing outside the limits of natural reason, and such a search requires faith. Not blind but in the expectation of results. Well the statement that they never had it right in the first place does not seem less presumptuous than the last claim! Would you include in that claim the Apostles? Jesus? Does this “new revelation” have anything to say about the scriptures? What Jesus and the Apostles said? What does it say about the warning against adding to the scriptures? Why should I believe that God has given new revelation? Don’t the Mormons claim the same thing, complete with a test for the truthfulness of that claim (one that I believe proves to be false)? I believe God is real. I believe He has revealed Himself through creation and spoken through the scriptures. I do not believe He has given “new revelation”. Perhaps you could offer a little something of this “new revelation” that might fill us in a bit about it. For example, where did it come from? Who was it “revealed” to? When? etc, etc. 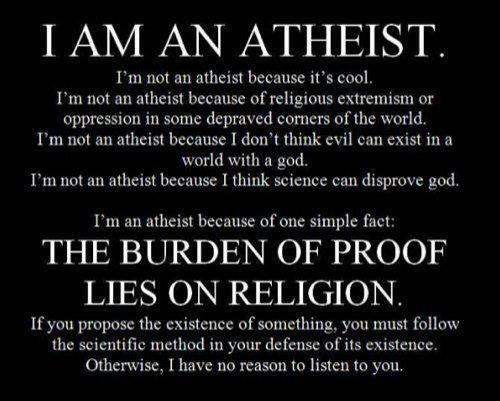 ” The burden of proof lies with religion” and rightly so. Now such a religious teaching exists, and in accordance with all the rigorous scrutiny one expects from scientific method. It even builds on evolution. The proof is not oral, or argument. But the claims it makes are testable for anyone who has the courage to take up the challenge. And just as any scientific paper is published so others can test it for themselves, so this new teaching is published on the web that very purpose. Equally, as in scientific scrutiny, what can demonstrate itself to be true, exposes those claims [think theological] existing outside the empirical paradigm, as nothing but pure codswhallop. And this new teaching does just that. I have already tested the new claim and teaching and found it to be and do exactly what it claims. No other religious conception known to history is able to do so. I no longer need rely upon any opinion, nor put my trust in priest or atheist. For this new teaching succeeds in delivering on the ‘burden of proof’ and reproof that religious history has failed to provide.